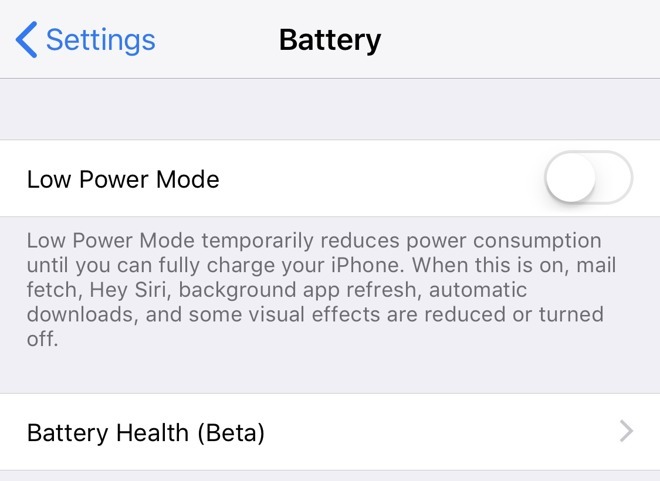 Upon updating to iOS 11.3 beta 2, users can now access the new Battery Health section within the Battery menu in Settings. It is clearly identified as a beta feature, and is sandwiched between the Low Power Mode switch and Battery Usage list. Users who select the Battery Health section are presented with two new details not previously viewable by users. The first is a "Maximum Capacity" percentage, which shows the relative capacity of the battery relative to when it was new. "Lower capacity may result in fewer hours of usage between charges," the section notes. 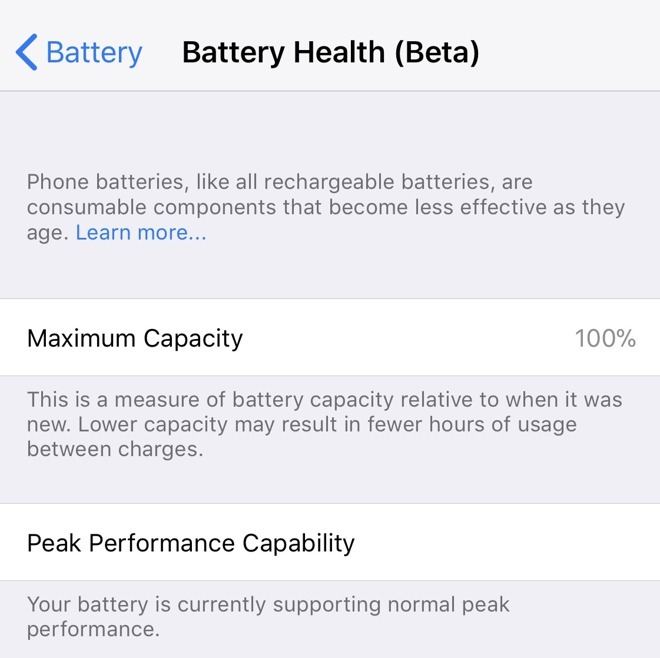 A second item lets users know the "Peak Performance Capability" of the battery. When a battery is new, accompanying text states that the battery is "currently supporting normal peak performance," meaning it is not throttled. As device batteries age, the Peak Performance Capability may change, and this is where Apple will disclose such information. For example, on aging devices that have experienced unexpected shutdowns, Apple will note that the issue occurred because the battery was unable to deliver necessary peak power. With iOS 11.3, users will be able to manually disable performance management protections if they choose. But that could leave an iPhone susceptible to random shutdowns at peak performance. A disclaimer at the top of the Battery Health menu reads: "Phone batteries, like all rechargeable batteries, are consumable components that become less effective as they age." It also includes a link to an Apple Support page that details the performance throttling options in iOS 11.3. The changes are being worked on after it was revealed that the company throttles CPU performance on older devices when the battery begins to deteriorate. Apple's throttling is done to ensure smooth operation, but some customers took offense to the fact that slowdowns were occurring without transparency to the user. Currently in beta, iOS 11.3 is scheduled to arrive this spring with ARKit 1.5 and a new Health Records function. Other features in the release include support for Advanced Mobile Location Support for iPhone location for first responders, four new Animoji for iPhone X owners, a renaming of iBooks into Books, and an Apple Music music video expansion.